Bryant, T. (2016). Building the Culture of Contingency: Adaptive Choice in Ludic Literature from Role-Playing Games to Choose Your Own Adventure Books. In A. Byers & F. Crocco (Eds. ), The Role-Playing Society: Essays on the Cultural Influence of RPGs (pp. 72–95). Jefferson, NC: McFarland. RPG and CYOA offered an escape to social anxiety created by contingency plans of the Cold War. 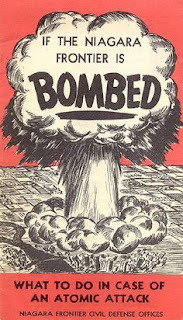 Surviving guides of the nuclear warfare of the 50s and 60s could be read like CYOA books (second person imperative, chunking information, overwhelming urgency and attainable agency). Even if some RPGs took place in fantasy worlds (secure distance), the tropes of decision making look like the ones of the Cold War: the player, even under extreme contingencies, still possess his own agency and his own commitment. He make adaptative choices with elements of uncertainty. He should prepare himself to face immediate and arbitrary dangers. My opinion: some ideas are poorly developed (so they are poorly convincing): fantasy themes could be a mean to avoid anti-patriotism (p.77); the dungeon crawling through traps and monsters could be a way to transform the anxiety of the nuclear vaults culture (p.79); RPGs are criticizing implicitly the lack of agentivity of the citizen facing the nuclear threat (p.83).